Introduction: A number of self-report measures have been developed that assess the subjective health status such as dental neglect; dental anxiety and oral health related quality of life. Aim: To access the association between clinical and subjective oral health status among school going children in south Bangalore. Methods: 300 completed questionnaires designed to measure oral health indicators were collected from both children (6-10 yrs) and parents. Caries was assessed using dmft index. Result: Out of 300 children examined 55.3% - girls 44.7% - boys. Children with infrequent brushing had more caries. 28% of parents monitored their children while 42% brushed on their own. More than half of the parents and children thought it was necessary to visit dentist frequently and oral health would affect general health. Conclusion: In our study dental self-report items showed high level concordance between child and parents and was found to be clinically valid. Maintaining good oral health is a persistent public health problem among children globally. Early detection and preventive approach toward treatment are always necessary. In recent years, oral health has been recognized to be an integral part of general health. Poor oral health of children can have a negative impact on their overall development and social well-being. The need to educate and create awareness among parents regarding oral diseases, availability of dental resources, and its impact on quality of life has a significant role in promoting oral health and hygiene among children since childhood. Untreated caries in deciduous dentition is the third most prevalent dental condition in India. Assessment of oral health status among schoolgoing children requires a simple, efficient, and reliable method of data collection. Clinical investigation is one of the methods of data collection, but it requires a sophisticated setup to be carried out efficiently. Due to resource constraints, a survey through a self-report, which is a possible alternative to clinical investigation, has been widely used in assessing the prevalence of various medical conditions. A dental self-report is a simple method of data collection from the respondents themselves without the interference of the researcher. The validity and reliability of the self-report are also important aspects of concern. There are very few studies regarding the assessment of oral health in children using dental self-report. A self-report captures child's dental experience and health service usage required as there is increase in the resource restraints in data collection. This study aims to assess and associate the clinical and subjective oral health status among schoolgoing children using a dental self-report as an oral health measure. The validity has been tested by providing the same questionnaire to the parent and child. The concordance of data obtained from the questionnaire to the clinical findings has also been tested and compared as a measure of reliability. A cross-sectional study was performed by enrolling children from few schools of South Bengaluru. The schools were selected based on the proximity from the dental college and willingness to participate in the study. Before scheduling the survey, the official permission was obtained from the heads of the institution where the survey was being conducted. Ethical clearance was obtained from the institution prior to the study. A total of 300 children in the age range of 6–10 years and their parents were enrolled in the study. Parents of students denying giving consent as well as children with special needs and those who are mentally and physically challenged were excluded from the study. A cover letter, consent form, and dental self-report questionnaire were sent home of each eligible child. The study was undertaken in the following two steps: completion of the questionnaire by both children and their parents and clinical examination of the children. The questionnaire was developed in English consisting of 17 close-ended questions. The general demographic information, such as age and gender, were taken. Knowledge, perceptions, and practices regarding oral health and hygiene were collected. Questions about toothbrushing and dental problems such as experience of tooth decay, pain or discomfort due to tooth pain, and its influence on absenteeism to school were asked. Questions about parents monitoring the child during toothbrushing were also asked. Questions to ascertain the self-perceived oral health, need to visit a dentist, and frequency of visiting a dentist were included. The perception about the influence of oral health over general health and on their appearance was also gathered. The questionnaires were completed separately by the children in the school under the supervision of caregivers or parents at home. The questionnaire from the parents was collected from the children the next day. All children were clinically examined by a single examiner using a plane dental mirror and explorer on a chair in optimal light. Tooth status was recorded as missing; missing due to caries, filled with decay, and decayed, and the decayed, missing, and filled teeth index was recorded. The data were collected and tabulated and were analyzed using EZR software version 1.37 (Saitama Prefecture, Japan) Level of statistical significance was set at P < 0.05. Analysis of categorical-dependent variables was done using Chi-square test. 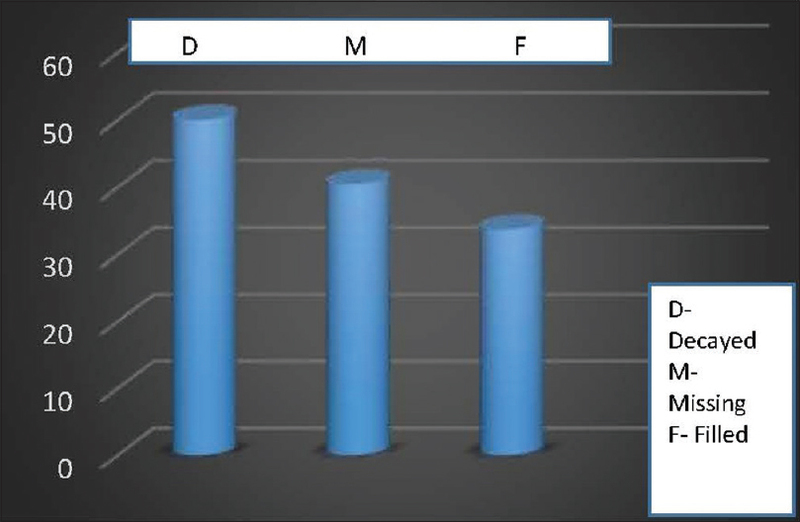 The frequency distribution for the study variables was expressed in terms of number and percentage. A total of 300 children in the age range of 6–10 years were included in the study, of which 44.7% were male and 55.3% were female [Figure 1]. Only around one-fifth of the samples were aged 6 years, less than one-fourth were aged 7 years, about one-fourth of the samples were aged 8 years, and almost half of the samples were aged 9–10 years. The data collected on various parameters were described in the following sections. Around 58.3% reported to brush once a day, 34% children reported to brush twice, while only 1% reported to brush more than twice and 6.3% reported that they do not brush. Nearly 98% of the participants used a toothbrush and toothpaste as an oral hygiene aid, whereas 1% used mouthwash as well as other oral hygiene aids. Almost 55.7% of the parents reported to supervise their children while brushing and 44% parents reported to advice their children regarding brushing. Nearly 85% of the participants thought that brushing teeth would prevent tooth decay. Around 25% of children reported to miss school due to tooth pain and 41% reported to have kept awake overnight due to tooth pain. Nearly 55% of the participants reported to visit a dentist, 82% of the participants thought that caries would affect the appearance of the child, and 81% knew that sweet food would affect the occurrence of caries [Figure 2]. Almost 88% of parents and children reported to care for their teeth like any other body parts and 69% of them reported believing that oral health would influence the general health. 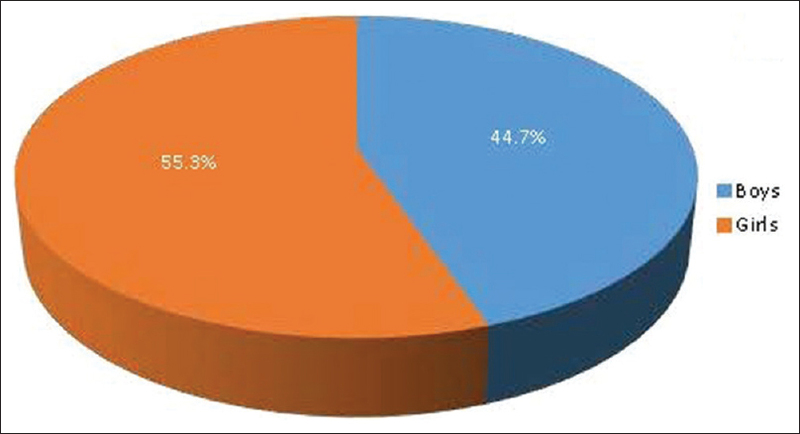 Caries was seen in 54% of the respondents; only 35% had filled teeth and 49% had lost teeth due to caries [Figure 3]. The World Health Organization recommends oral health promotion through schools for improving oral health knowledge, attitude, and behavior of schoolgoing children for the prevention and control of dental diseases. There are a very few dental self-reports that have been reported regarding the oral health status among schoolgoing children in Bengaluru. In our study, there is a high level of concordance between the self-report of children and caregivers and also in between children's self-report and their clinically measured oral health. The parents who monitored their children while brushing reported decreased incidence of dental decay and its associated consequences, which was similar to a study done by Sarnat et al., indicating that mother's knowledge and attitude toward dental health has an impact on child's oral health. In this study, only 50% of the study population thought that it was necessary to go to a dentist. Moderate amount of awareness was observed among the parents regarding the general health influence on dental health and a positive attitude was observed among them with regard to the prevention and management of dental caries. A study conducted by Navneet et al. found that Indian population have low level of oral health awareness compared to the Western group, and an effort on the part of parents has been missing predominantly. Other studies have demonstrated that positive attitude of the parents and children toward dentist and dental awareness has a link between oral health and systemic well-being. A study conducted by Fukuda et al. reported that general health is closely related to oral health and indicated an urgent need for increased oral health education to avoid the consequences of dental disease for long-term oral health. Therefore, more awareness and reinforcements to enhance the positive attitude in parents and caregivers toward dental health are required to further decrease the prevalence of dental decay among schoolgoing children. A dental self-report measure helps in testing and monitoring the oral health and is of importance in countries where clinical oral health investigations cannot be conducted due to various constraints. Awareness of parents about oral health care would significantly influence a child's oral health status. Jackson SL, Vann WF Jr., Kotch JB, Pahel BT, Lee JY. Impact of poor oral health on children's school attendance and performance. Am J Public Health 2011;101:1900-6. Jürgensen N, Petersen PE. 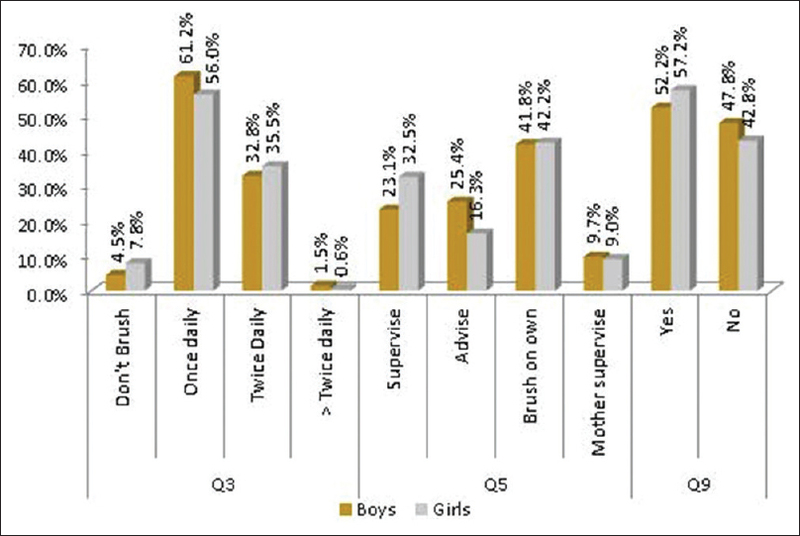 Oral health and the impact of socio-behavioural factors in a cross sectional survey of 12-year old school children in Laos. BMC Oral Health 2009;9:29. Jamieson LM, Thomson WM, McGee R. An assessment of the validity and reliability of dental self-report items used in a national child nutrition survey. Community Dent Oral Epidemiol 2004;32:49-54. Mahejabeen R, Sudha P, Kulkarni SS, Anegundi R. Dental caries prevalence among preschool children of Hubli: Dharwad City. J Indian Soc Pedod Prev Dent 2006;24:19-22. Sarnat H, Kagan A, Raviv A. The relation between mothers' attitude toward dentistry and the oral status of their children. Pediatr Dent 1984;6:128-31. Godara N, Godara R, Khullar M. Impact of inhalation therapy on oral health. Lung India 2011;28:272-5. Fukuda JT, Sonis AL, Platt OS, Kurth S. Acquisition of mutans streptococci and caries prevalence in pediatric sickle cell anemia patients receiving long-term antibiotic therapy. Pediatr Dent 2005;27:186-90.